For IELTS Task 1 there are sometimes two or three pie charts that you must compare. The pie charts may represent different years and show trends over time. You need to describe the changes and similarities / differences between the pie charts. 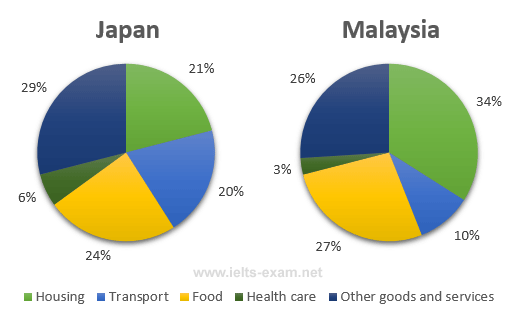 The pie charts below show the average household expenditures in Japan and Malaysia in the year 2010. The pie charts show the proportion of money spent on various household expenses in Malaysia and Japan in 2010. We can see that in Malaysia the greatest proportion of expenditure (34%) was on housing, .......... in Japan housing accounted for just 21% of the total. .........., in Japan the greatest single expense was other goods and services at 29%, .......... 26% in Malaysia. Food came in second place in Japan, at 24%, while in Malaysia the actual proportion was .......... (27%). In Japan another major expense was transport, at 20%, but this was much .......... In Malaysia (10%). In both countries the .......... percentage of expenditure was on health care. .........., the data .......... that in both cases food, housing and other goods and services were the .......... expenses, .......... that in Japan, transport and other goods and services took up a .......... proportion of total expenditure .......... in Malaysia.